Let us examine what you can expect to learn in one of our schools. 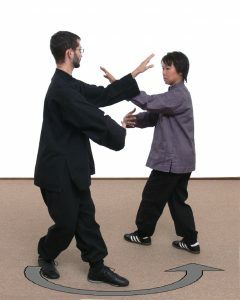 Jiulong Baguazhang is a very deep and rich method that has evolved over a period of 400 hundred years. Much care has gone into the planning of a logical curriculum designed to give you the best and most complete learning experience possible. 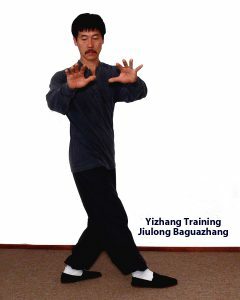 Jiulong Baguazhang is not your typical Baguazhang as found today in China or anywhere in the world. 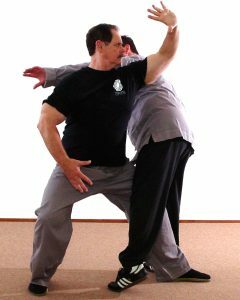 Jiulong or Nine Dragon Baguazhang is a method of self-defense that is true; however it is much, much more than that. Students study the art through a series or progressive lessons designed to open their mind and body to higher levels of flexibility. We not only stress physical flexibility but also flexibility of the mind that in time manifests as emotional and psychological understandings concerning the psyche of the individual practitioner. 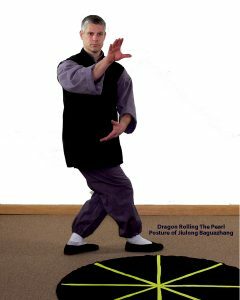 The beginning training for all students no matter what their previous experience begins with Dragon Rolling The Pearl Baguazhang Basics Course. This method was created to give students a template toward understanding the primary basic keys to developing the art. This includes physical skills for power and speed and mental skills for focus and calmness of spirit.Students in our main school at The Gompa or any of our branch schools or study groups are taught Dragon Rolling The Pearl Basics program by certified instructors using a specific formula that all schools must follow in every class from the beginners to the advanced students without exception. 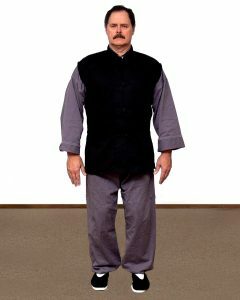 All classes teach “quiet sitting” this is a basic art that is the foundation of all Li family arts especially Jiulong Baguazhang. 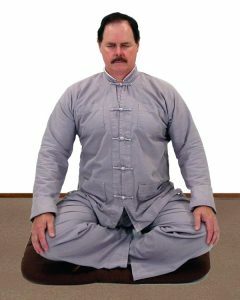 Quiet Sitting is not meditation in the strict senseof the word it is a mind body exercise designed to bring the student into control of the mental processes necessary to create awareness and then to develop sense memories, paramount in training Nei-gong (internal power exercises) without this knowledge beginning with correct breath control, body awareness and then the ability to use the mind to produce physical sensations one cannot be truly practicing an internal art. Students learn this method of mind guided movement exercises which are practiced at the beginning of every class to improve the mind body connection. Our Daoyin is derived from Daoist and Tibetan yoga. 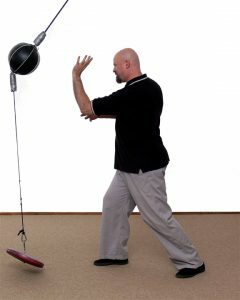 It is specifically designed to improve flexibility for the type of actions to be used in Baguazhang training. It is also an exercise that allows for the use of skills from Quiet Sitting. Each of the movements focus and or isolate parts of the body, joints, muscles or organs to improve blood flow, increase flexibility and allow the mind to fully command the movements of the body. the body through utilizing the mind influencing the nervous system to produce sensations of expanding, contracting, lifting and pushing on invisible objects. 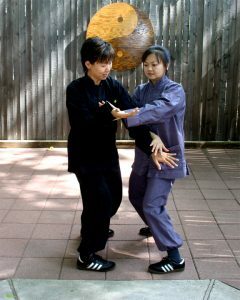 This is the key to Yixingong or intention, attitude skills which is the core of all internal art or nei-gong practice. Students who do not follow this path are not practicing Jiulong Baguazhang and will only be doing the internal art externally. Once these abilities are achieved they are migrated into the following exercises that are performed in every class experience. Learning to use the legs as the main first source of generating kinetic force is the goal of shifting. The study begins in Dragon Rolling The Pearl basic training and will be used in all of the eight palms. It is this basic exercise that teaches the student how to transfer ground force into the torso and finally into the palms. The moves are first learned as simple physical exercises and then they are enhanced by the addition of sense memories of Yixingong (Yizhang) that simulate feelings of pulling or pushing with any part of the body including shoulders and or palms. There are two very special terms used in Li family arts one is Yizhang (mind palm) and the other is Yixingong (intention attitude skill) they both refer to the same principle which is that of using the mind to influence the strength and speed of the body. Yizhang training begins with Quiet Sitting and continues into Power Standing training. Once the student understands how to create imaginary but palpable feelings within the body he begins to apply these to his walking and circling exercises. It is this Yizhang that makes an internal art truly internal and the skill that allows solo forms to make the body feel as if it is really dealing with external forces from an enemy. 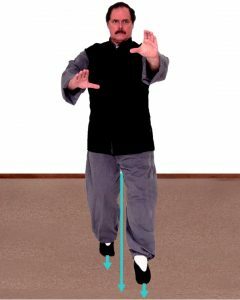 Classes who have learned shifting will graduate into linear walking training. Here students learn how to use momentum to generate kinetic force from the same concepts found in shifting training. 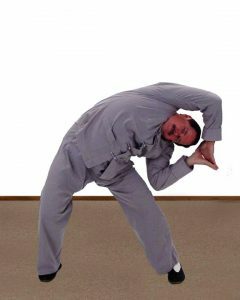 This training begins with one step drills and proceeds to strolling about the room in a linear fashion forming the postures and shapes being studies as in Dragon Rolling The Pearl on any one of the Eight Palms. 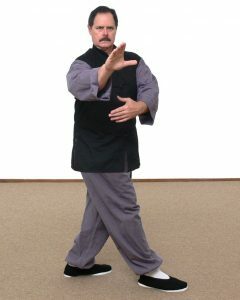 Linear walking allows us to explore methods of using walking to produce tremendous whole body power so that the Baguazhang boxer can strike while walking or running without having to stop and root to the ground. When Yizhang is added this training becomes truly internal. many, many lessons to be learned before moving on to walking in multiple circles progressing from up to nine. 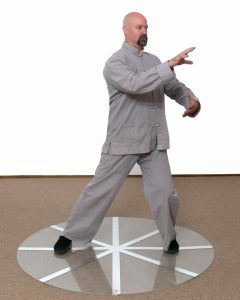 Jiulong Baguazhang has no memorized forms or routines each circle walking experience is a pantomime of combative actions that change from simple to complex as the students knowledge improves. In the application phase the students learn to apply principles of the previous knowledge base through a series of very important games designed to improve awareness, sensitivity, and reaction speed and body control under stress. There are three levels of application training. Willow Bends, Two Dragons at Play and Push-Palm art. Each level of study from Dragon Rolling The Pearl has a specific focus in playing the Willow Bends push-hand games. There are many games within this one game designed to help the student understand how to read the actions of an opponent through touch. Other levels of the game help to train us how to use the leg, torso connection and a principle called Crossing The Great River to use whole body force on another individual while simultaneously fending off his attack. In this game we find many levels of training. Beginners learn to move in synchronicity with a partner, mirroring his actions to develop skills for defense. Later he merges with the partner by moving in and out along a spiraling path. He learns when it is time and not time to bring up the defensive postures and much more. In a later version we learn how to “turn the attackers corner” to get behind and him and control his movements. These games can by a good instructor be used to help a student get over his or her fears of touching or being touched both softly or quite firmly by another person. They are very helpful and must be a part of every schools program from Dragon Rolling The Pearl through each and every one of the Palm studies. straight in or out attempting to achieve a specific goal. Some might be just to wedge each other, or prevent an arm or wrist lock from being applied.In others it may involve a student attempting to place a palm or foot on his partner simulating a strike, while the other individual must defend, blend and control the attacker’s energy. There are many levels to these games as well all leading toward understanding how to neutralize and if necessary counter push, throw or strike an opponent. These games are played at a very slow speed at first but will eventually speed up to full walking speed and later to faster combat speeds with full protective equipment being used. Students are taught how to develop speed and power for martial applications through the use of poles or trees, heavy bags, speed bags and striking pads.Each palm may have specific typed of equipment that help the student develop the unique power of the particular palm energy.Jiulong Baguazhang has many unique exercises using speed bags and heavy bags for neutralizing force as well as striking with full body power. Your instructor will guide you in these methods designed to suit your own particular needs. out above. When you join one of our schools you can expect the highest level of training from certified teachers with many years of experience. If you are a prospective member or student of any of our schools and have any concerns please feel free to contact us at Thegompa@aol.com we will be happy to help you.